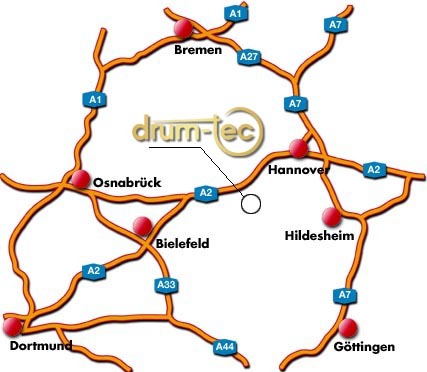 Here's how you will find drum-tec North! A2 Hannover-Dortmund, exit Bad Eilsen East. After the exit turn to the left. At the following intersection turn left on the B83 with direction Hameln/Hessisch Oldendorf. Follow the B83 for a long time. Leave the B83 at the exit called "Fischbeck/Gewerbepark Goldbinnen". Next turn left. Before you cross the railway, you will find us on the left side. "Fischbeck/Gewerbepark Goldbinnen". Next turn left. Before you cross the railway, you will find us on the left side.